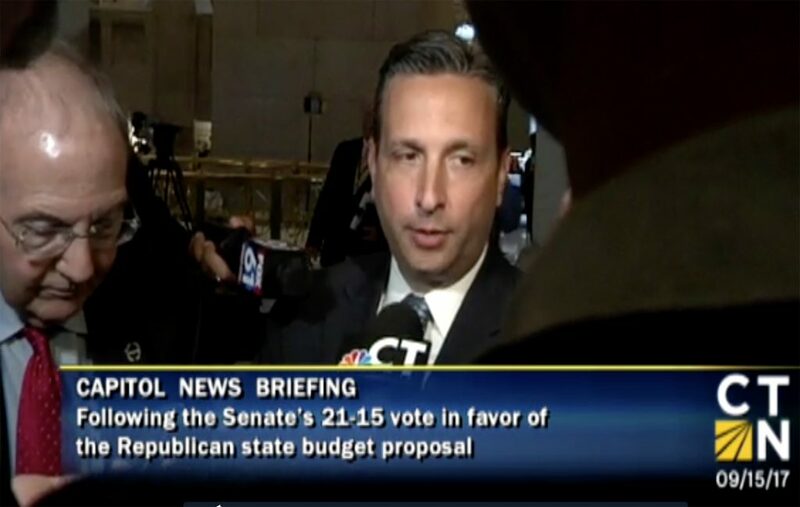 State Senate Majority Leader Bob Duff (D-25) talks to reporters Friday in an interview broadcast on CT-N.
NORWALK, Conn. — The Democratic-dominated state legislature passed a Republican budget Friday. It has “more gimmicks in there than I think should be allowed in any kind of a budget,” State Senate Majority Leader Bob Duff (D-25) said in an interview broadcast on CT-N, repeating assertions made earlier this week that Gov. Dannel Malloy will never sign the budget. While State Rep. Gail Lavielle (R-143) ballyhooed the budget on Facebook, gaining kudos and support, State Rep. Bruce Morris (D-140), who is running for mayor, released a statement in the wee hours of Saturday morning damning the budget. Norwalk would lose $3.9 million in Priority School District grant funding alone, Morris said. Laveille, in an early Saturday Facebook message, said the budget now goes to Malloy. Malloy at 8:08 p.m. released a statement saying he would not sign the budget. “You all know this governor, he is not going to sign a budget that is put together with superglue and tape,” Duff said in another CT-N interview, before the Senate voted Friday afternoon. 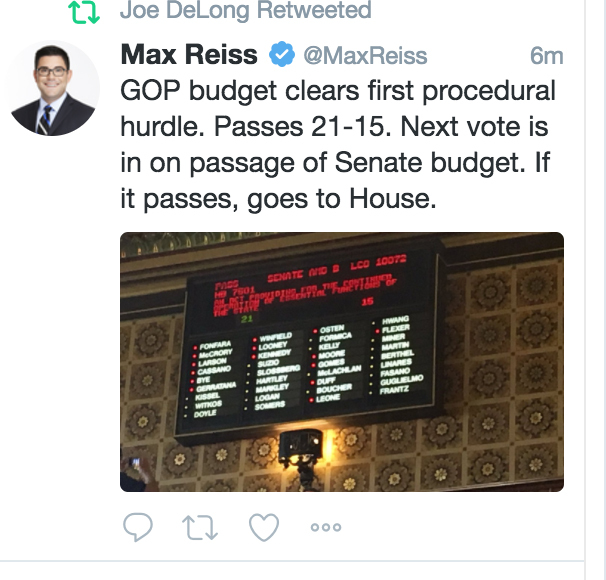 A Friday afternoon Tweet tells part of the story from the Connecticut Statehouse. Lavielle, in the early Saturday Facebook conversation, said, “In my experience, most legislators vote for something because they think it’s right — not because of how they think someone else will vote on it. It is now up to the governor to decide whether or not he wants to hold up the budget process and to prolong the duration of his executive order — something he has said that he does not want to see happen. “This is a critical juncture for our state, and what happens now will affect everyone in Connecticut,” Lavielle said on the House GOP website. Duff, earlier this week stood alongside House Majority Leader Matt Ritter, D-Hartford, and Senate President Martin Looney, D-New Haven, and House Speaker Joe Aresimowicz, D-Berlin in a 10-minute interview broadcast on CT-N, and said nothing. On Friday afternoon, three Democratic senators voted with Republicans to approve the Republican budget. The Republican budget is “over 1000 pages long, that we did not see until the end of the debate today from the Republicans,” Duff said. Charges of a lack of transparency come from both sides. Democrats promised a budget Thursday and finally released a document at 6 a.m. Friday. “It is 914 pages, and we’re all trying to read it as fast as we can,” Lavielle posted at 2:10 p.m.
“Majority Democrats have told their members and the public that legislators have only two choices: vote for the budget they did not publish until early this morning, or allow the governor’s Executive Order to take effect. This is not true: the Republican budget provides a solid alternative. “The Republican budget includes no new taxes, protects education funding, and restores and preserves funding for essential services like those for people with intellectual disabilities, the elderly, and the mentally ill. It also includes structural changes to state government that will restore fiscal stability and put the state’s economy on a sustainable path for the long term. Morris voted against it, according to the press release. Triples the cut to earned Income Tax Credit, hurting the working poor. The budget includes a combined cut of $309 million for UConn and UConn Health over the biennium that includes $185 million for the Storrs and regional campuses and $124 million for UConn Health, jeopardizing its continued operation. These cuts will result in major tuition increases – combined with cuts in financial aid, a UConn education would be unaffordable for many Connecticut families. “I believe the amended budget that passed in the Senate today is unbalanced, and if it were to reach my desk I would veto it. It relies on too many unrealistic savings, it contains immense cuts to higher education, and it would violate existing state contracts with our employees, resulting in costly legal battles for years to come. If the responsible solution I negotiated with Democrats isn’t going to pass, then it is incumbent on the legislature to reach a new agreement soon – one that is realistic and, ideally, bipartisan. “Today’s vote in the legislature was a surprise, and it may represent a shift in the dynamic of the General Assembly. But it isn’t a shift for me. I have consistently been in favor of reaching a sensible, realistic budget – one that is balanced honestly and that continues to make progress on Connecticut’s long-term fiscal challenges. Those are not partisan goals, nor should they be. It’s why I began inviting all legislative leaders – Democrat and Republican – into my office last year, well before this session began. And it’s why I continued those meetings throughout the regular session. AccuBob finally has something to say about a budget. He had 6 moths to read this budget, but then goes on to say how transparent his one is…..the one they just released yesterday a few hours before it failed to get the votes it needed. It had scores of earmarks, funding for new government departments and agencies, and is based on the same type of revenue forecasts that have been falling short for years. This GOP one may not be the best budget, but the reality is we are all screwed if we don’t turn around the state’s finances. A few million here and there is not the end of the world compared to billions upon billions of lost dollars in property values. If we have to raise taxes a few hundred dollars on the local level, that is far better than continuing to watch our homes lose 100s of thousands in value never to be recovered. If you think that can’t happen, you have missed what has happened to cities like Detroit and Bridgeport, which were at one time some of the richest cities in the country. Hopefully this is a sign to the business and investment communities that Connecticut is serious about it’s spending problems and views government as a service not as an entitlement. The Governor can veto this if he wants to cement his legacy as the worst governor in the history of the state. Or he can sign it and get serious about right sizing our government for what is left of his lame duck career. SIGN or RESIGN Governor Malloy. I may not agree with all of Morris’s reasoning. I see some painful cuts to Norwalk but some others that might be in order. Hard for me to judge from my position of ignorance which social safety net programs are worth it and which are wasteful. But based on cuts to the State Department of Education alone, I’d have to conclude the SDE was mighty bloated to begin with and cuts are in order. Increases total aid to Norwalk by $998,464 the first year and $1,856,814 the second year. No earmarks (payoffs to individual legislative districts for playing political ball with their leaders) except for one. Paid for by further realigning State employee compensation towards private sector levels. Actuarial assumptions reviewed and signed off by a professional actuary firm. Does not bail out Hartford, which in my opinion has an unsustainable cost structure. Funds important social services such as Meals on Wheels,etc. Implements the Spending Cap and a Bonding Cap. Prioritizes Transportation projects for future bonding purposes. Our budget passed the House this morning 77-73 with the support of five courageous democratic colleagues. Of Norwalk’s legislative delegation: Wood, Lavielle and myself voted YES – while Perone, Morris and Duff voted NO. I have reviewed Senator Duff’s objections and find them to be incomprehensible. 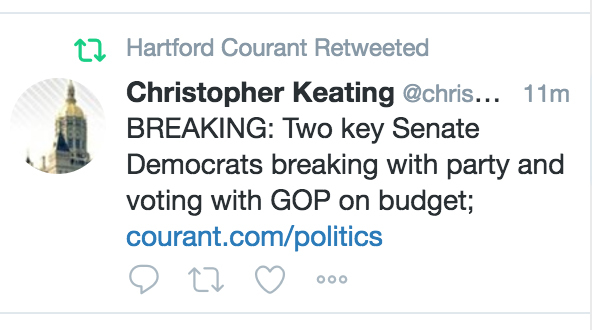 Like our budget or not, the reality is the Hartford democratic leadership that has been running our beautiful State has failed to get the job done. Furthermore there is a reason why Dan Malloy is one of the worst rated Governors in the entire USA. In response the House & Senate GOP, along with our brave democratic colleagues, offer a striking new approach – one that starts the journey out of our fiscal crisis and starts turning this beautiful State around. Mr. Wilms…your statement reads, “no earmarks except for one”…who is the one…. and why did 77 state representatives think that this particular district was entitled to special consideration? Hi Tom, I realized my statement almost begs for your question!! The town of Groton, which is home to the Coast Guard Academy. Hundreds of their students utilize base housing for which no property tax is paid. The earmark is compensatory for that. Our approach is to seek no earmarks in general – but if we do one – to publicly itemize (which we did on the House floor). @Fred Wilms, thank you and other Norwalk reps for supporting a budget that moves the state forward. As I look through the list of cuts, I see programs that perhaps should never have been funded to begin with. It is possible to support the practice of minority hiring, for instance, and not have to fund this at the state level through the SDE. What exactly is the teen pregnancy program at DSS, and how much does it cost taxpayers? How much does Norwalk depend on state funding for bilingual education, and how effective is this program? Just looking at the proposed cuts, it’s easy to see that CT has operated a luxury budget funded through tax dollars. I hope Governor Malloy, who does not intend to run again, will sign this budget and move us forward. Thanks to Rep Wilms and everyone who voted for this budget. This is the beginning of the end of the usual monkey business in the state of Connecticut. And I still believe that the corruption and bad decisions won’t end until all of our politicians only be paid expenses and do their duty for one dollar. Thank you Fred…and I concur with that decision…please keep up the good work. Only hindsight provides some clue as to the games played by our state legislatures. One has to wonder why SEBAC was negotiated first? As I read this – the GOP budget suggests labor cost cuts that are not possible due to the new SEBAC agreement, and Malloy is saying he can’t sign the budget because they will be illegal, and we don’t need google to recall the 300 million we taxpayers swallowed due to Rowlands egregious errors. Further – @Pamela Parkington – good catch with CEP. Sorry Fred, respect you but the dark money is the root of every evil in politics now – Citizens United is a joke – corporations are not people entitled to free speech, and this flow of money is only making our entire country less democratic. It goes to show you there is no good side to our political parties – like saying Crips are better than Bloods – when both are gangs. If you think that’s crazy – why the shock when three legislators “broke” with their party and voted their conscious. GOP smiling now – not so much when Murkowski, Collins, and McCain ended the travesty that was Repeal/Replace health care. Working Parties is already lining up far-left pro-union candidates as payback. Duff Duff Duff is horrified because he knows he’ll get creamed inside his party for not controlling the feral cats – but not a negative word from fellow dems on how he can’t do simple arithmetic. Folks – listen up. Bill Parcells the football coach once said – you are what your record says you are. It’s time for a reality check. There are 50 states. We are behind Mississippi right now – 50th place. We have spent money we didn’t have, taxed residents to the point of exodus, and created a partisan political climate where nothing gets done. Be ashamed. We have multiple cities – Hartford, Bridgeport, Waterbury, New Brittan, that are mosh-pits of despair. And there is no accountability – this failure has not cost a single legislative member his/her paycheck, or god forbid – lifetime benefits. Norwalk – we can’t fix the state – but we can fix us. Get POLITICS out of city hall. Stop the gang war. It’s not blue versus red – it’s US. Let’s elect a non-political candidate to take this city back to focusing on smart, thoughtful planning and execution. We have to – Hartford is financially and morally bankrupt. Duff, the Senate majority leader, scoffed at the notion that the vote would place the General Assembly on track to a bipartisan budget resolution. “Let’s be frank about this,” Duff said. “This budget is not some sort of fairy tale ending to a budget crisis. Fred still waiting on Quintard ave for you to step up to the plate and become our rep. Your not out of the woods yet. “They didn’t even know what’s in it and they voted for it,” Duff said. Yup, sounds just like the democraps when they signed Flubamas Health care act…. You make fair points about the CEP program. As a practical matter, we recognize there is no way to get 100% agreement on our Budget. Hundreds of pages long, with thousands of line items and roughly $20 billion of spending items, it is impractical to expect anything close to that. So we are keeping track of public comments on individual items – kind of like we do for public hearings. As these comments collect we will be revisiting to see where we can tweak or modify. CEP may become one of them. Finally if the Governor decides he wants to negotiate with the GOP, I imagine that CEP might be one of the discussion points in those negotiations. Fred, can you speak to what the total cuts to Norwalk’s Education budget would be? I understand we only lose ~$79k in ECS/SPED,but Bruce Morris’ statement says this budget cuts Priority School District Grants, which means we lose $3.9million. What becomes of the Alliance funding? What is the full impact? It may be a moot point, if the Governor vetoes the budget, but it is important for Norwalk that you fight for these funding dollars during any negotiations for a compromise budget. Thank you, as always, for your service and communication. I’m a Democrat and have been for most of my life. I’m now 65 and worked for more than 40 years. Unfortunately, now Im on Social Security Disability, Medicare, and Husky. At this point I think the Republican budget is better than NO budget and that Gov Malloy is abusing his power! !